Have you ever wondered why, during winter, some deciduous trees (trees that let their leaves fall to the ground) still have a clump of leaves on a branch? It turns out that these leaves do not belong to the tree; they actually are a different plant, a mistletoe. Mistletoe plants occur in every continent on the planet and they belong to different families and genera. 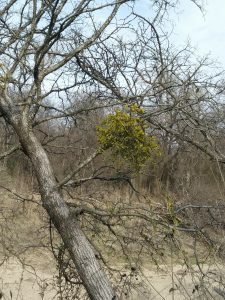 The most common found mistletoes in North America, including here at River Legacy, are species that belong to the genus Phoradendron. 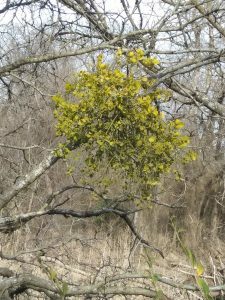 Mistletoe plants are hemiparasitic plants, meaning they are parasites of trees most of the time but can still undergo photosynthesis. Photosynthesis is the regular process through which the majority of plants produce their own food, using sunlight, water, and carbon dioxide to produce nutrients. They attach themselves to the tree at the stem and start absorbing from the tree or shrub. Though they are considered pests and can damage significantly and even kill trees, mistletoe plants may not be all that bad. Research suggests that some mistletoe species can actually help the tree disperse its seeds, as it attracts birds that eat the fruit of the tree. As we approach the final days of winter, walk the trails at River Legacy and take a look at the leaf-less trees and see if you can spot any mistletoes on a tree or shrub. ← The Great Backyard Bird Count Is Here!